This kit includes the Inglesina Classica Bassinet, Raincover for Classica Bassinet, Toddler Seat, matching diaper bag and a Balestrino Frame with Basket. 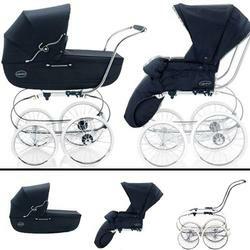 This is the premium Classica package, to be used from birth (with the included bassinet) to 36 months. Once your child outgrows the bassinet the Classica seat, offering four adjustable positions, accommodates your little one from any angle. Convenient storage pockets are located on the sides of the stroller seat. For the colder months, we have included a coordinated winter footmuff to keep your baby warm. The chromium-plated curved steel handle is padded with pure leather featuring hooks to connect the included matching diaper bag. The Inglesina Classica Pram is an heirloom quality pram par excellence, with an unmistakable romantic and traditional style. Crafted of prime quality materials for elegance that doesnt age. Artisan manufactured with a classic wooden structure. Includes th stroller seat with hood to convert this classic pram into a elegant stroller when your child gets older. The Inglesina Classica pram comes complete with an elegant diaper bag of the same color.